To rejuvenate old worn looking lawns or fill bare spots use a slice seeder or Mataway overseeder to apply lawn seed for best germination . 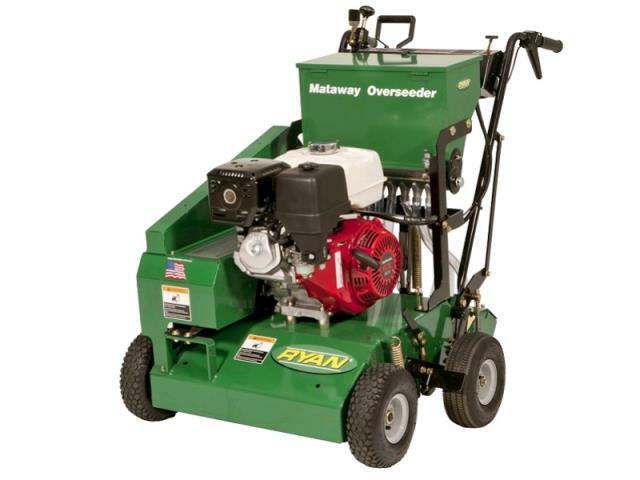 The Ryan Mataway Overseeder delivers seed straight to the curve shaped discs, placing it directly into the soil slits for unmatched seed-to-soil contact. You can seed at variable rates for different grass varieties and applications. The seed flow rate is easily controlled right from the operators station, and the flow stops automatically when the reel is raised for maximum control and precise operation. For the best fill pattern seed flow can be reduced to 50% of recommended lbs per sq. ft. for double passes, cross hatch at 45 degrees on second pass. has a 25lb seed hopper with adjustable drop settings. A 19" vertislicing delta reel powered by a 5.5 hp Honda gas motor. wt. 453 lbs length 50" width 35.5" height 44"